How can we know whether a claim someone makes is scientific or not? The question is of the utmost consequence, as we are surrounded on all sides by claims that sound credible, that use the language of science—and often do so in attempts to refute scientific consensus. As we’ve seen in the case of the anti-vaccine crusade, falling victim to pseudoscientific arguments can have dire effects. So how can ordinary people, ordinary parents, and ordinary citizens evaluate such arguments? The problem of demarcation, or what is and what is not science, has occupied philosophers for some time, and the most famous answer comes from philosopher of science Karl Popper, who proposed his theory of “falsifiability” in 1963. According to Popper, an idea is scientific if it can conceivably be proven wrong. Although Popper’s strict definition of science has had its uses over the years, it has also come in for its share of criticism, since so much accepted science was falsified in its day (Newton’s gravitational theory, Bohr’s theory of the atom), and so much current theoretical science cannot be falsified (string theory, for example). Whatever the case, the problem for lay people remains. If a scientific theory is beyond our comprehension, it’s unlikely we’ll be able to see how it might be disproven. Physicist and science communicator Richard Feynman came up with another criterion, one that applies directly to the non-scientist likely to be bamboozled by fancy terminology that sounds scientific. Simon Oxenham at Big Think points to the example of Deepak Chopra, who is “infamous for making profound sounding yet entirely meaningless statements by abusing scientific language.” (What Daniel Dennet calls “deepities.”) As a balm against such statements, Oxenham refers us to a speech Feynman gave in 1966 to a meeting of the National Science Teachers Association. 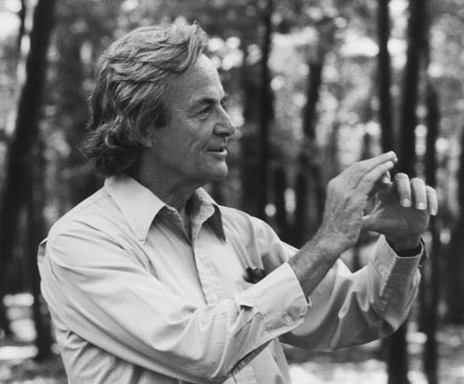 Rather than asking lay people to confront scientific-sounding claims on their own terms, Feynman would have us translate them into ordinary language, thereby assuring that what the claim asserts is a logical concept, rather than just a collection of jargon. Without using the new word which you have just learned, try to rephrase what you have just learned in your own language. Without using the word “energy,” tell me what you know now about the dog’s motion. Does Feynman’s ordinary language test solve the demarcation problem? No, but if we use it as a guide when confronted with plausible-sounding claims couched in scientific-sounding verbiage, it can help us either get clarity or suss out total nonsense. And if anyone would know how scientists can explain complicated ideas in plainly accessible ways, Feynman would. Science ‘for the people’ is a very dangerous idea. The IQ bell curve for lawyers overlaps with the curve for home economics majors. Yet lawyers, simpletons really, are forever suing doctors because doctors have yet to invent a pharmaceutical without side effects. Lawyers might as well demand a perpetual motion machine from the pharmaceutical industry. When Galileo was alive all the books were written in Latin. In his day, scientists were all fluent in Latin and mathematics as the language of science. As Shakespeare explained: “First, we kill all the lawyers.” Next, let’s restore mathematics as a prerequisite to a college diploma. Tell that to Roald Dahl. Or more recently the low-vaccination California town that had to quarantine its school to prevent a measles outbreak. Nothing worse than a kid who has to suffer because of the ignorance of their parents. I am disappointed in this article because it was oversold, or as the article sums up, “Does Feynman’s ordinary language test solve the demarcation problem? No….” But given that the answer to the question of how we tell the difference between science and charlatans has to be edged up to, rather than definitely stated as a formula, maybe that tells us something about what science is. Maybe it is just organized pursuit of knowledge using different tools and methodologies in different fields, as required by the hierarchy of priests in that field. I do not use “priests” to be snarky, but when it comes down to it, aren’t we just watching anointed ones declaring or disputing or just moving on to other issues that interest them from time to time. The key is that the work they do, if not falsifiable, is at least public and subject to replication by others or criticism of their methods, logic and results. I notice the US Government is still paying out hundreds of millions of dollars to children who have suffered from negative reactions to vaccines. There are no peer reviewed studies that prove any one vaccine is both safe and effective over the long term. Not one. The Scientific method requires skepticism, not beliefs. is “home economics majors” a dogwhistle term for women? Gross. You kinda destroyed any credibility you might have, right there. What country are you from that something so fundamental as understanding mathematics is not the prerequisite to get a diploma? Shame on you. Your type has resulted in deaths of many children and the reemergence of diseases previously under control. Feynman may have been influenced by the popular books of rhetorician Rudolf Fleisch and his push for clear thinking and plain language in the 50s and 60s. Try explaining a small proof from theoretical computer science or abstract algebra using “ordinary language”. You’ll fail. You might be able to give a 30,000 foot view of the larger subject area that the proof is from, but explaining the proof itself is often impossible using ordinary language. You just followed an article about one of the greatest scientific minds of the modern era and his ideas about scientific thought and language with a simple-minded, unsubstantiated opinion devoid of any hint of scientific fact or reasoning. Did you not read the article or were you not able to understand it? Beware of those who insist that because something isn’t explained in simple language it can’t be true. A common logical fallacy that is becoming less and less common as our education standards slip lower and lower. Popper first published his ideas in 1934, not 1963. But the 1934 book was in German so the English speaking science community was unaware of it until he translated it and republished. It is a heafty tome, but it is readable. Most of the people who dismiss Popper seem not to have read it. Really? here would we go to read more about this million-dollar payout system? Communication is a separate skill from research. Feynman was a propagandist and charlatan. His work is designed to mislead and nothing more. Something that has been used for over 1,000 years and has managed to eradicate several diseases that used to kill thousands every year is a pseudo science?